The 2008 Beijing Olympics were awesome. Usain Bolt, Team USA basketball, Phelps, Walsh & May volleyball. I was glued to the TV every night for a week. The most memorable moment for me, however, was Michael Phelp’s 100m butterfly. Phelps was in 7th place (out of 8) at the half-way point. Despite the huge deficit, he came back to challenge Milorad Cavic in a thrilling finish. 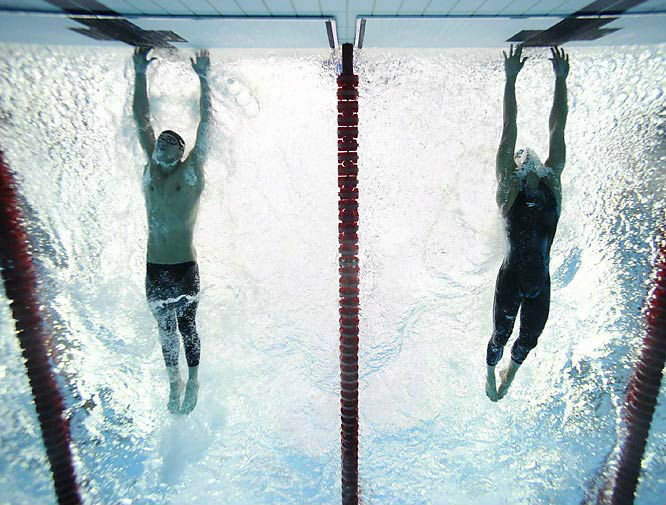 Phelps won by 1/100th of a second. When we train everyday, sometimes there are workouts you don’t like, don’t want to do. Bob says you’re putting money in the bank. I guess I put a lot of money in the bank over the last four years, and we withdrew pretty much every penny in the bank. After Bob and I both grab a little break, it’ll be time to start depositing. For most people, success in life requires hard work and dedication. We don’t wake up and become programming superstars or master pianists overnight. Even Malcolm Gladwell, in his book “Outliers”, has stated it takes 10,000 hours of deliberate practice to become an expert in a field. But putting in the hours, doing drills, and practicing is simply not fun sometimes. There are many days I would rather flip on the TV instead of work on a side-project. Or stop off at Chipotle instead of the gym on the way home. When the urge for that happens, I try to remember Phelp’s quote, which is a great motivator to help push me forward with the training or task at hand. Maybe the extra 15 minutes you put towards your project each day won’t end up making a difference. Or maybe it will, and be the factor between success and failure. Keep putting money in the bank. You never know when you’ll need it.